A little bit of post-workout soreness can feel good. I like to think that it’s our body’s way of reminding us that we had a great workout. Too much of it is bad. Too much stiffness and soreness can make it uncomfortable to sit, stand, and walk. Feeling this sore can make it tough to put 100% into your training. You can prevent feeling this way by taking the right supplement in the correct amount. Gaspari Carnipure is one such product that gives you a clinically proven dose in every serving. Just What Is Gaspari Carnipure? This supplement is a patented form of the compound carnitine. It is made up of l-carnitine and l-tartrate. Combining these compounds makes it much more effective. Alone, l-carnitine is a good supplement. Combining it with l-tartrate to make Carnipure make it great. What make Gaspari Carnipure better than other supplements are that it tastes great, mixes easily in water, and contains a clinically proven dosage in every serving. Many other l-carnitine supplements only give you ½ or less of the amount needed to see benefits in a formula that takes awful. 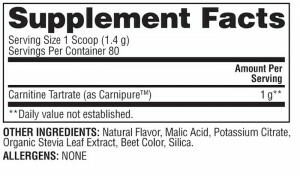 1 gram carnitine l tartrate per serving – the dosage & type of carnitine proven to work. Zero calories, carbohydrates or sugars – okay to use no matter what your diet. No artificial sweeteners, colors, flavors – no funny flavors or potentially bad ingredients. Refreshing pineapple flavor – tastes great with no funny aftertaste. 80 servings per container – enough to last at least a month! 1.Does Carnipure Have Any Other Benefits? It sure does. Check out the list below to see how else it may benefit your health and performance. Less Workout Related Soreness – even after really hard workouts. Recover Faster – helps your muscles feel ‘rested’ faster between workouts. Sexual Health – increases sperm function in men. Fat Loss – helps transport fats into your cells for energy. 2. Who Should Take Gaspari Carnipure? All of you who lift weights and train hard on a regular basis. You athletes who want to be able to train and perform harder, longer. Any of you that feels sore after their workout. If you’re dieting to lose weight. 3. How Should You Take Gaspari Carnipure? According to the manufacturer, one scoop mixed in water is a serving. They recommend taking it either before or after your workouts and/or during the day for a total of 2-3 servings. I find it to be really refreshing without any of the aftertaste you often get from this type of supplements. The pineapple flavor works well in water or when added to a protein shake. Whichever way you take it, you won’t get tired of it’s flavor any time soon. 1. Giamberardino MA, Dragani L, Valente R, Di Lisa F, Saggini R, Vecchiet L. Effects of prolonged L-carnitine administration on delayed muscle pain and CK release after eccentric effort. Int J Sports Med. 1996 Jul;17(5):320-4.2. Kraemer WJ, Volek JS, French DN, Rubin MR, Sharman MJ, Gómez AL, Ratamess NA, Newton RU, Jemiolo B, Craig BW, Häkkinen K. The effects of L-carnitine L-tartrate supplementation on hormonal responses to resistance exercise and recovery. J Strength Cond Res. 2003 Aug;17(3):455-62. 3. Spiering BA1, Kraemer WJ, Vingren JL, Hatfield DL, Fragala MS, Ho JY, Maresh CM, Anderson JM, Volek JS. Responses of criterion variables to different supplemental doses of L-carnitine L-tartrate. J Strength Cond Res. 2007 Feb;21(1):259-64.